Woah, it seems to be ages since I last wrote nails of the week post! I have been painting my nails weekly and always forget to blog about them, but not to worry I am about to gift you for my mistakes. Today I bring you a duo of polishes I received in my Latest In Beauty - Ultimate Summer Nails Box, I didn't end up using them in summer which is just plain silly! When I did finally get the chance to use them I am never been more impressed. Nails Inc to me is what you call 'high end' you are only able to buy them near me in big department stores and they don't come cheap either. Their polishes are from £8 onwards and the price you are paying is worth it. These aren't the full size bottles, which are much bigger but using the mini ones has made me want to add the full size bottles on to my never ending wish list. I had to apply 2 even coats of the polish as it was very sheer the first time round, regardless it was just a easy brush to use and the formula is amazing! I waited for them to dry as long as possible to add the glossiest top coat I have ever used in my life. This top coat lives up to the hype it gets on shopping channels, it makes my nails look so glossy and shiny that they look professionally done with gels. This photo doesn't show you just how bright the colour is, it is eye popping. Looking online for the links to this post it is actually a neon shade, who would have guessed! 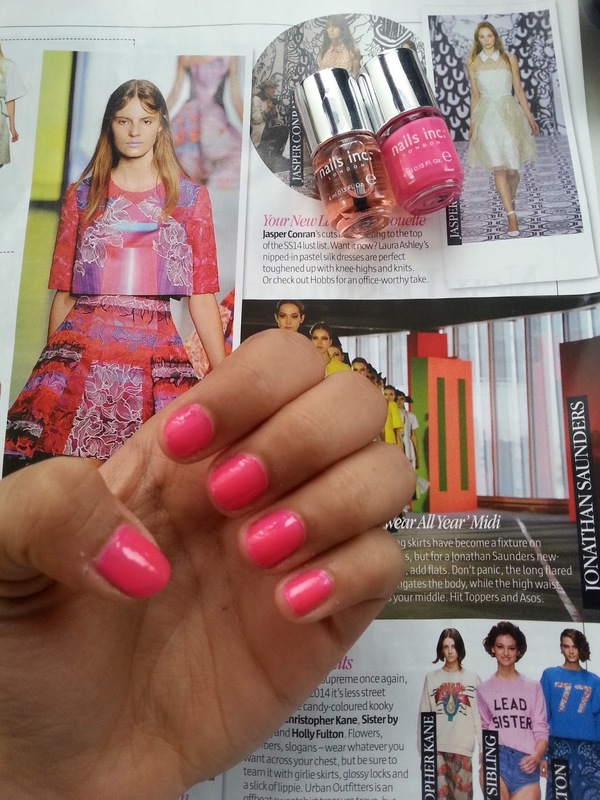 Pink must be the only summer colour I wear in the winter months, but who cares! It has done so good with not chipping as well. hmm, loving it so far! Pretty colour! I just love Nails inc polish!